Remarkable shifts in political power, left-right clashes over economic and military matters beset key nations of Western Europe. Where is an increasingly polarized and unstable Western Europe headed? WESTERN EUROPE is in the throes of almost whirlwind political changes. Sudden and often radical shifts in government are becoming the norm. Even more serious is the growing phenomenon of governmental instability coupled with extreme polarization of political viewpoints. Specific reasons behind the political shifts vary from country to country. In most cases, two fundamental issues stand out. The first is Europe's prolonged recession, resulting in record unemployment in some countries. The second issue, rapidly becoming the more important of the two, revolves around the broad spectrum of East-West relations. It focuses primarily on the emotional issue of nuclear weapons. The French launched the spate of changes when Socialist President Francois Mitterrand's 1979 election victory ended a two-decade long succession of conservative governments. In an aftershock, Mr. Mitterrand took four Communists into his Cabinet, hoping to insure peace with organized labor. This action stunned certain of France's Western allies. Mr. Mitterrand also initiated an expansionist economic policy with large-scale public spending. But the plummeting value of the French franc has forced him to retreat to an austerity program. As a result the government is faced with widespread worker unrest. In Greece, Andreas Papandreou led his Panhellenic Socialist Movement to victory in October, 1981, giving Greece its first nonconservative government in 16 years. Mr. Papandreou promised major reforms on the home front, and suggested Greece would pull out of NATO and the Common Market. But he has since moderated his views. In Sweden, Olof Palme, prime minister from 1969 to 1976, ushered his Social Democrats back into power in September 1982. This switch ended liberal Sweden's brief six-year-long experiment with moderate conservatism. In his own attempt to enliven the sluggish Swedish economy, Mr. Palme is promoting some of the most radical socialized economic reforms ever conceived. Voters in other European countries have installed center to right-of-center governments into office, hoping that they might possess the "magic cure" to solve intensifying national problems. In Denmark, the first Conservative prime minister in 81 years, Poul Schleuter, immediately initiated an austerity program after his election last September. A similar situation prevails in Norway where Kaare Willoch's one-party minority government represents the first time that conservatives have been in power in that country in 50 years. Finally, Belgian Premier Wilfried Martens, a Christian Democrat, assumed power a year ago campaigning on a platform of austerity to defeat a center-left coalition. Belgium's economy is one of the weakest in Europe. Elections also took place in the Netherlands and Italy in 1982. In each case, however, the proliferation of political parties prevents a radical swing in either direction, and also prevents stable governments from being formed. This phenomenon virtually guarantees new and inconclusive elections every several months. The most dramatic reversals of political orientation, however, have occurred in Spain and West Germany. Only seven years ago Spain emerged from nearly four decades of authoritarian rule. After the death of Generalissimo Francisco Franco, Spain cautiously waded into the democratic waters. Since 1977, a political party in the center dominated the government. Then last October Prime Minister Leopoldo Calvo Sotelo's party was all but wiped out, incredibly losing all but 13 of its 155 seats. The Socialist party under Prime Minister Felipe Gonzalez swept into power with a clear majority. Spain, many experts believe, is now dangerously polarized, left and right, with a gaping hole where the moderate center once existed. The largely right-wing Spanish military leaders-traditionally leery of democracy-are extremely unhappy with the outcome. They believe that the triumphant Socialists, like their predecessors in the 1930s, will move yet further to the left, coming under Soviet influence (even though the official Communist party lost ground in the election). The army, under Franco's rule, put a halt to socialism once before, igniting the 1936-39 civil war. The true test of strength will come when the Socialists attempt, as they claim they will, to bring the military under control of the civilian government. The program of the Socialists appears moderate on the surface. But critics denounce them as "wolves in sheep's clothing" who will radicalize the economy once they take firm control. The announcement by the new leftist government that it is considering reneging on Spain's approved membership in NATO is also unsettling to many. It is in West Germany that perhaps the most foreboding developments have occurred. In a seldom-used parliamentary move last autumn, the center-left government of Chancellor Helmut Schmidt was replaced by a center right coalition. As in Spain, the political center is close to disappearing, resulting once again in greater polarization between left and right. The small, centrist Free Democratic Party (FOP), now in the government, is not expecting to win enough votes to be returned to parliament in the scheduled national elections. Many German citizens are concerned over their country's future. There are few signs of economic recovery over the horizon. Unemployment, for one, is expected to escalate still further, making life difficult for Chancellor Helmut Kohl. The fear of political instability, however, disturbs Germans even more. Other peoples, such as the Italians, seem to be able to adjust to political uncertainties, and to revolving-door governments. The German national character simply demands more orderliness. The biggest threat to continued stability in West Germany is represented by the "Greens," a radical party that has mushroomed almost from nowhere in the past few years. The loosely organized Green movement comprises an amalgam of environmentalists, antinuclear opponents and other single-issue activists. The Green movement has supplanted the slumping FOP as the third party in six of the 11 West German Lander, or states. But the Greens, far off to the left, "doing their own thing," do not act out the role of a traditional power-balancing swing party in the middle. It is easier, claim their critics, to see what the Greens oppose than what they support. "We are the antiparty party," claims a top Green official. In state after state where they are represented, the Greens have refused to cooperate with the established parties in forming workable coalitions. The big fear is that they will repeat this process should they be elected to the West German Bundestag, or federal parliament, making the country virtually ungovernable. To the Greens, politics is not "the art of the possible." There simply is no room for compromise. Green leaders have adamantly stated they will not cooperate with other parties unless their views on environmental, economic and especially defense matters are accepted. "We won't move on these matters," says a key leader of the Greens, Petra Kelly. "Others must come to us." Despite their divergent single issue causes, the Greens are almost 100 percent united around one dominant issue: They are dead set against new intermediate range nuclear missiles scheduled to be placed by NATO on West German soil later this year. Green leader Kelly states that "there must be no Pershing 2 or cruise missiles, either sea based or land based. Then we must start to move out of the NATO power bloc. And there must be a shutdown of all German nuclear power plants." The Green leadership is gearing up to call for massive demonstrations at construction sites for the new missiles. Heated confrontations with law enforcement agents are virtually assured, guaranteeing exciting television coverage. Such a prospect, of course, is of concern not only to the new government in Bonn, but to the other member governments in NATO, especially the United States. Britain, too, is becoming subject to political uncertainty and the growing potential for left-right clashes. The same issues are involved: the economy and nuclear weapons. Conservative Prime Minister Margaret Thatcher, in office since 1979, still enjoys high popularity in the polls above Labour and the new Liberal-Social Democratic alliance. But Mrs. Thatcher, who is pursuing a tight-spending policy and plans to denationalize many industries, is confronted with record high unemployment. More than 3.3 million Britons are out of work. The prime minister has considered calling elections later this year ahead of May 1984, the end of her five-year term. The economy will certainly be a major issue in the coming campaign. But, in addition, the Labour Party, winner of some recent parliamentary by-elections, will be confronting Mrs. Thatcher with a radical new posture on national defense. After toying with the idea for years, the Labourites are close to adopting a position calling for Britain's unilateral nuclear disarmament. 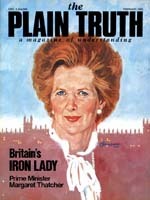 Specifically the program endorses the scrapping of Britain's Trident missile system ordered by Mrs. Thatcher, the closure of all nuclear bases in Britain, including those of the United States Navy and Air Force, and the cancellation of the NATO cruise missiles scheduled for deployment in 1983. Almost simultaneously, a report from a committee of the Church of England, the official state church, has called for virtually the same program. This greatly angered Mrs. Thatcher and Conservative party leaders. The unilateral disarmament issue in Britain runs parallel to the growing demands in many quarters of the United States for a so-called nuclear freeze on the further development and deployment of nuclear weapons by both the United States and the Soviet Union. Further disturbing NATO military leaders is a pastoral letter proposed by American Roman Catholic bishops. It would admonish Catholic military personnel from carrying out specific aspects of U.S. nuclear defense policy- specifically the so called first use of nuclear weapons in Europe, the very core of NATO's "flexible response" nuclear deterrence policy. There are leading officials in Western Europe, especially in West Germany, who are deeply disturbed over trends taking place in their own societies, as well as in the United States, specifically involving the nuclear defense issue. A recent article in an American journal calling for the abandonment of NATO's first use policy drew a hurried response from a number of West German political, military and academic leaders. Abandoning first use, they warned, could "destroy the confidence of Europeans and especially Germans in the European-American Alliance... and would endanger the strategic unity of the Alliance and the security of Western Europe." One particular West German official is certain to have a greater impact on the future of these issues-Franz Josef Strauss, minister president (governor) of Bavaria and a power behind West Germany's new government. If the conservative parties win in the next West German elections, Herr Strauss may emerge as the most influential politician in the country, assuming the positions as foreign minister and vice-chancellor. Herr Strauss, formerly his nation's defense minister, has drawn attention to the fact of Europe's unprecedented period of peace. For more than 37 years, he notes, while well more than 100 wars have raged elsewhere in the world, Europe has experienced peace-albeit a nervous peace guaranteed by the nuclear "balance of terror." "Leading officials in Western Europe are deeply disturbed over trends taking place in their societies"
"We must make our population, and in particular the young generation," said Dr. Strauss, "acquainted with the basic ideals of peace in our time. Peace in our time cannot be achieved by unilateral surrender, cannot be achieved by a unilateral disarmament." In the coming months, look for growing left-right confrontations inside Western Europe and the entire Atlantic Alliance, especially over the issue of nuclear arms. In the meantime, also look for influential leaders to move ahead on certain options of their own, just in case the reliability of NATO's nuclear deterrent structure, based upon American and British forces, weakens still further. Almost alone in Europe, France has been spared public controversy over nuclear weapons. Its government announced, in fact, that it has decided to go ahead with production of a neutron bomb. At the same time, it has been revealed that the governments of France and West Germany are cooperating more than ever before in the coordination of their defense policies, including greater coordination on nuclear strategy. As the pages of The Plain Truth have announced for years, watch for an eventual alternative-the formation of a Western Europe unified politically and militarily. As Herr Strauss envisions it: "A United States of Europe with its own nuclear deterrent." The decline of the reliability of the American "nuclear umbrella," as well as the smaller-scale British deterrent force, will make such a policy seem to European leaders to be necessary for Europe's own survival.